Another timelapse video – see how I needle felt a ladybug. This is a great project for beginners. Here’s another Christmas needle felting video – you can follow the process of how I make a snowman. 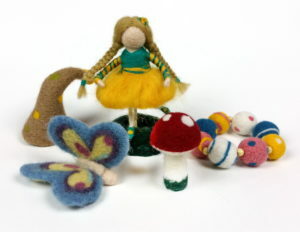 Here is another needle felting video. This time I’m making sheep and using natural curly wool. Enjoy! This is my second take on Nativity. This video is a complete timelapse – 4 hours of work compressed into 15 minutes.